Analysis: Foreman, who missed the first 12 games of the season due to his recovery from a ruptured Achilles, was active for just the second game since his return Week 14. The history of players returning from similar injuries is not encouraging, particularly for running backs, per this study in the journal Foot & Ankle International. That doesn't mean he can't be an impact player in 2019, but fantasy owners should proceed with caution. Analysis: With Foreman sitting out Sunday's regular-season finale, the Texans' Week 17 rushing attack will be headed by Lamar Miller (who is back from an ankle injury) and Alfred Blue. Foreman is active for Sunday's game against the Eagles with Lamar Miller (ankle) sidelined, Aaron Wilson of the Houston Chronicle reports. Analysis: Foreman, a 2017 third-round pick, acted as the top complement to Miller for the majority of his rookie campaign before tearing his Achilles' tendon Nov. 19 of that year. The lengthy rehab he required after surgery resulted in him opening the season on the PUP list before he was activated earlier this month. He'll now get the chance to make his season debut, likely handling a limited role on offense behind fill-in starter Alfred Blue. Coach Bill O'Brien said Foreman may be active for Week 16 in Philadelphia, Aaron Wilson of the Houston Chronicle reports. Analysis: Foreman was activated from the PUP list Dec. 4 but hasn't actually been active for any games. Lamar Miller's ankle injury may create an opening Week 16, with Alfred Blue and undrafted rookie Buddy Howell representing the other options at running back. Even if he ends up playing, Foreman would probably have to settle for a small role in a multi-player backfield. He's still an intriguing asset in dynasty/keeper leagues, but the appeal is limited in redraft formats. Foreman (coach's decision) is inactive for Saturday's game against the Jets. 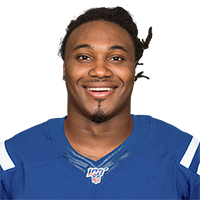 Foreman is inactive for Sunday's game against the Colts. Analysis: Foreman is now available after coming off the Texans' PUP list, but he'll remain the odd man out for now, with Lamar Miller and Alfred Blue on hand to lead the team's backfield in Week 14. Coach Bill O'Brien said that Foreman ran well and looked healthy during his three-week rehab window and could potentially help the Texans, Deepi Sidhu of the Texans' official site reports. The Texans have activated Foreman (Achilles) off their PUP list. 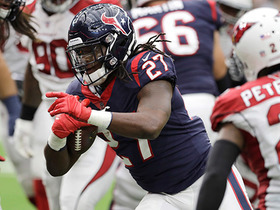 Analysis: Foreman adds to the 9-3 Texans' running back depth, but John McClain of the Houston Chronicle suggests Foreman is no lock to be active on gamedays out of the gate, given the health and overall effectiveness to date of Lamar Miller and Alfred Blue. The Texans are tied for second in the NFL with 140.8 rushing yards per game. Coach Bill O'Brien said the Texans still haven't decided if Foreman (Achilles) will be activated from the PUP list, Aaron Wilson of the Houston Chronicle reports. Analysis: Foreman returned to practice Nov. 14, opening a 21-day window for the team to decide whether he'll be activated to the 53-man roster or placed on injured reserve. The Texans apparently intend to take it down to the wire ahead of Wednesday's deadline, perhaps favoring a cautious approach with Lamar Miller coming off four 100-yard rushing performances in his past six games. Of course, Foreman might represent an upgrade on No. 2 running back Alfred Blue, who is averaging 3.5 yards on 128 carries. Coach Bill O'Brien revealed Tuesday that Foreman (Achilles) is not "all the way back" yet, Deepi Sidhu of the Texans' official site reports. Analysis: Foreman is in the midst of his 21-day evaluation period for a return from injured reserve and has reportedly been making some progress. 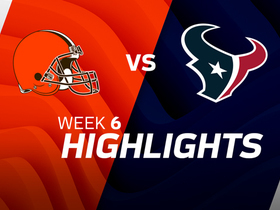 O'Brien's comment suggests Foreman stands a slim chance of suiting up in Week 13 against the Browns, though the running back hasn't officially been ruled out yet. With Lamar Miller averaging 4.9 yards per carry after a huge Week 12 performance, Foreman isn't guaranteed to have a meaningful role in the offense if/when he is activated from IR. Foreman (Achilles) said he's making daily progress and is optimistic about his chances to rejoin the Texans over the next two weeks, Aaron Wilson of the Houston Chronicle reports. Analysis: Foreman, who underwent surgery on his Achilles last November, hasn't experienced any setbacks since he began practicing, but still has two weeks remaining on the physically unable to perform list. 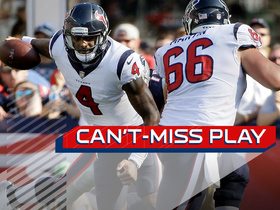 As such, the Texans don't need to rush him back for Week 12 against the Titans on Monday. Though Foreman (Achilles) was cleared to practice Wednesday, it's not expected that he'll be available to play Sunday against the Redskins, Sarah Barshop of ESPN.com reports. "What type of shape is he in? Can he carry the ball more than two times in a row without having to go get a drink of water?" coach Bill O'Brien said, when asked about what factors the team would consider before activating Foreman from the PUP list. "He had a good year last year. That was a long time ago, so let's just...see where he's at." Coach Bill O'Brien said Foreman (Achilles) will take part in practice Wednesday, opening a 21-day window for the Texans to activate him from the PUP list, Aaron Wilson of the Houston Chronicle reports. 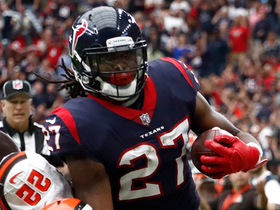 Analysis: As Foreman predicted Monday, the Texans have cleared the running back to embark on the final phase of his recovery from a torn Achilles, which he sustained Nov. 19, 2017. If he eventually makes enough progress to return to the 53-man roster, he'll re-enter a backfield composed of Lamar Miller and Alfred Blue. 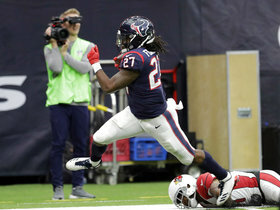 Foreman (Achilles) "definitely" expects the Texans to open his 21-day window to be activated from the PUP list this week, Aaron Wilson of the Houston Chronicle reports. Foreman (Achilles) is expected to return to practice following the Texans' Week 9 game against the Broncos, Ian Rapoport of NFL Network reports. 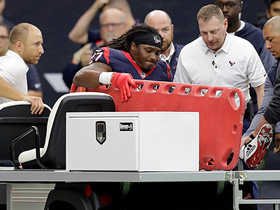 NFL Network Insider Ian Rapoport brings the latest information on the injury to Texans running back D'Onta Foreman. 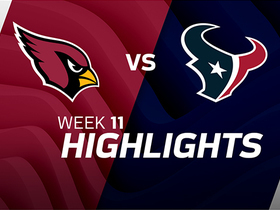 Watch to see the best plays of the Week 11 matchup between the Arizona Cardinals and Houston Texans. 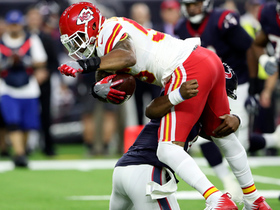 Houston Texans quarterback Deshaun Watson makes a tackle on Kansas City Chiefs linebacker Derrick Johnson after a Texans fumble. 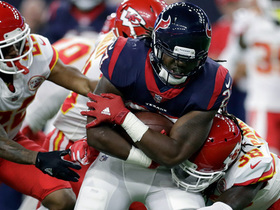 Houston Texans running back D'Onta Foreman pushes through Kansas City Chiefs defenders for 25 yards. 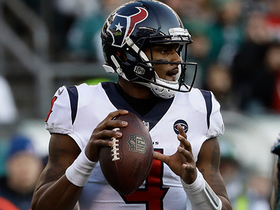 Houston Texans quarterback Deshaun Watson shows his magic skills and avoids four sacks and finds running back D'Onta Foreman for 31 yards.